We’d love your help. 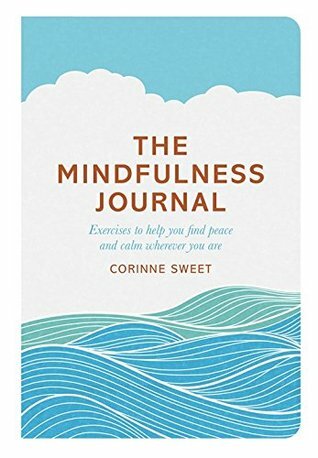 Let us know what’s wrong with this preview of The Mindfulness Journal by Corinne Sweet. The Mindfulness Journal offers an introduction to mindfulness and easy exercises that can be In today's busy world, finding physical and mental space for peace and calm amidst the competing demands of work, family and friends can be a challenge. Mindfulness is a simple and powerful practice that can help you cut through the noise and reclaim tranquillity, wherever you are. To ask other readers questions about The Mindfulness Journal, please sign up. This was a very thoughtful gift from a friend who knows that I often struggle with stress and anxiety over a myriad of things. I took my time reading through this, even though I could have read it in one sitting, and I'm glad I did because it gave me a chance to actually try out a few of the many meditative mindfulness practices that the book provides. The book seems to cover almost every possible situation where you might need a dose of mindfulness to get you through - everything from getting to This was a very thoughtful gift from a friend who knows that I often struggle with stress and anxiety over a myriad of things. I took my time reading through this, even though I could have read it in one sitting, and I'm glad I did because it gave me a chance to actually try out a few of the many meditative mindfulness practices that the book provides. The book seems to cover almost every possible situation where you might need a dose of mindfulness to get you through - everything from getting to sleep, gardening, the work commute, and dealing with grief/loss is covered in here, and all the practices are realistic and simply written. The practices are accompanied by lots of pretty illustrations, and steer clear of any kind of spiritual content which I really appreciated. There are also lots of blank pages for you to take notes in, as the 'journal' element of the book's title suggests - this is where it falls a little flat for me, in that the pages are blank (I would prefer lined pages), and the binding is quite tight so it would be a little difficult to write in it. Useful to dip into and to remember that practice doesn't need to be at a set time every day but can be part of your daily life. A beautifully designed to-the-point book on Mindfulness in an over saturated market. The space to journal thoughts and observations is a welcome addition however due the binding the book is very tricky to write in. For anyone looking for a more in depth book on the subject I (like the author) recommend Full Catastrophe Living: How to Cope With Stress, Pain and Illness Using Mindfulness Meditation by Jon Kabat-Zinn. This would make a nice gift and introduction to Mindfulness. Struggled to finish this book. Probably better as a coffee table book than as a read for those actually seeking help or advice. O carte care te ajută să-ți definești mai bine rolul și locul în această lume. Cu ajutorul acestei cărți înveți să prețuiești fiecare clipă și mai ales clipa prezentă, te împrietenești cu propriul corp și propriile gânduri, pentru a avea o viață mai armonioasă. A tons of cliché with a few good thought. The book design in the Hungarian print is amazing, I loved it. Utter tripe. Don't bother. The format is almost entirely the same. 2. Sit/Lie/Stand. Breath. Think about problem. By far one of the worst self-help books I've ever read. It aligns cognitive therapy with ~magical benefits~ such as no longer experiencing any physical pain in the intensive care ward. This books only saving grace was the beautiful use of negative space and illustrations by Marcia Mihotich - if the written work wasn't so preachy and I was to rate this book on aesthetics alone it would be a 5/5. I loved the texture, flat graphics and consistent and appropriately 'calming' teal. Don't waste your m By far one of the worst self-help books I've ever read. It aligns cognitive therapy with ~magical benefits~ such as no longer experiencing any physical pain in the intensive care ward. A soothing and serene read. This book shares many mindfulness exercises for specific emotions and experiences that one may have throughout the day, such as confrontation, sleepless nights, racing thoughts and preparing for the day ahead. I especially enjoyed the simple and soothing illustrations and inspirational quotes that reinforce the book's overall concepts of positivity and resilience. This is just the right book to dip into when in search of a mindful moment. A nice easy read. Some beautiful quotes and helpful exercises for incorporating mindfulness into your everyday life. The author takes into account all sorts of situations and emotions that might arise, and provides meditations that will help you move through it without letting your emotions take over. This journal really helped me get through a stressful time in my life. Very clear and simple. It is basically explain about "one recipe" and how to modify it in any situation. I bought this thinking it would be an interactive journal that I could write in. It is not. It is full of great mediatations for plenty of situations in your life. 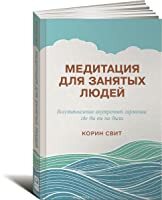 Оказалось, что это сборник упражнений, а не книга. Упражнения довольно однотипные, кстати. Найдите 20 минут. Сядьте. Медитируйте. Beautiful journal. The color and illustrations are very serene. Inside are quotes and prompts to find a less stressful existence and to be aware of the goodness around you. I love the lined pages for jotting your own thoughts and open area for any date, so there is no pressure to write every single day. Very nice journal. A nicely relaxing read. It strangely gave me a great sense of calm by just letting the words delve into my soul. The breathing exercises and decluttering combined with calming imagery and easy to read text. A nice easy introduction into the simpler side of meditation, breathing and mindfulness. Good selection of chapter's and easy exercises. Quick and relaxing easy to do and anywhere for most situations. . .
Lovely little book, beautiful messages inside.